The Contigo Gizmo leak proof bottle is perfect from first water bottle up to early school age. Kids will love this water bottle – so easy for them to use from the first water bottle, push the button in and the straw pops up and when finished an easy push down on the lid and the straw is closed again and protected by the lid, so no accidental touching it with dirty hands. And the little ones love being able to carry their bottle around – and even more proud when they realise their name is permanently marked on the flip down lid for the straw. And you can’t loose the straw in this bottle as it is tethered to the lid – can be taking loose for cleaning, but will still be attached, so no loosing in down the drain. It comes in 7 different designs: dinosaurs, birds, flowers and yacht, jungle dino, shark and wink dancer. BPA-free and dish washer safe on top shelf. Fantastic drink bottle Iv bought two for my 2.5 year old (lost the first one) so easy for him to use that Iv had to buy another for his baby brother who keeps pinching his! I’ve bought the flowers and the birds designs for my little girl, and she loves it, been using it since she’s about a year (needed help pushing hard to open it at first), but now that she’s 14 months, she can open it herself and loves to carry it everywhere out in the yard because it’s so cute and portable. I have been using these for my kids for the past 4 years. 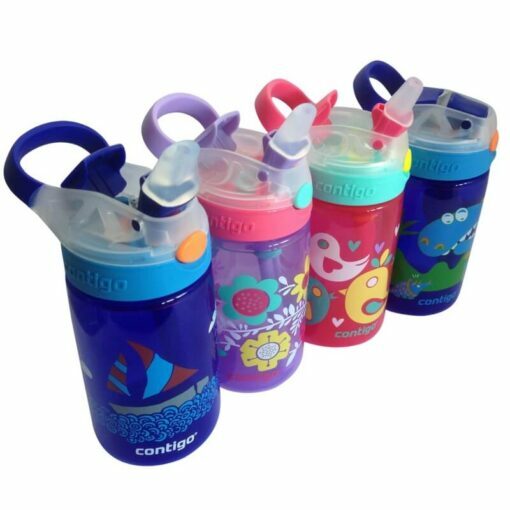 They are the best drink bottle for little ones – easy to use, very durable and don’t leak. Having the name marked means they don’t get lost at Kindy!